With forecasters at the Burea of Meteorology (BOM) warning of more wild weather this weekend, the Australian Veterinary Association (AVA) is urging pet owners to prepare and plan to protect their animals. 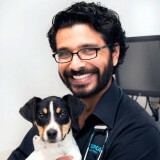 Another widespread rainfall event developing over southern and eastern Queensland and inland northern New South Wales has prompted Dr Guy Weerasinghe, President of Public Health at the AVA, to issue guidance for pet owners on identifying and managing storm phobia. “Storm events getting more intense and are going to be exacerbated due to climate change, and it is critical pet owners are prepared.